Double-staining (IHC) of the expression patterns of kdr and Vmat2 at 48h post fertilization. Double-staining (IHC) of the expression patterns of kdr and Vmat2 at 72h post fertilization. Double staining of the expression patterns of kdr:mCherry (magenta) and Vmat2:GFP (green) in a 72h old zebrafish larvae. Double-staining (IHC) of the expression patterns of kdr and Vmat2 at 5 days post fertilization. 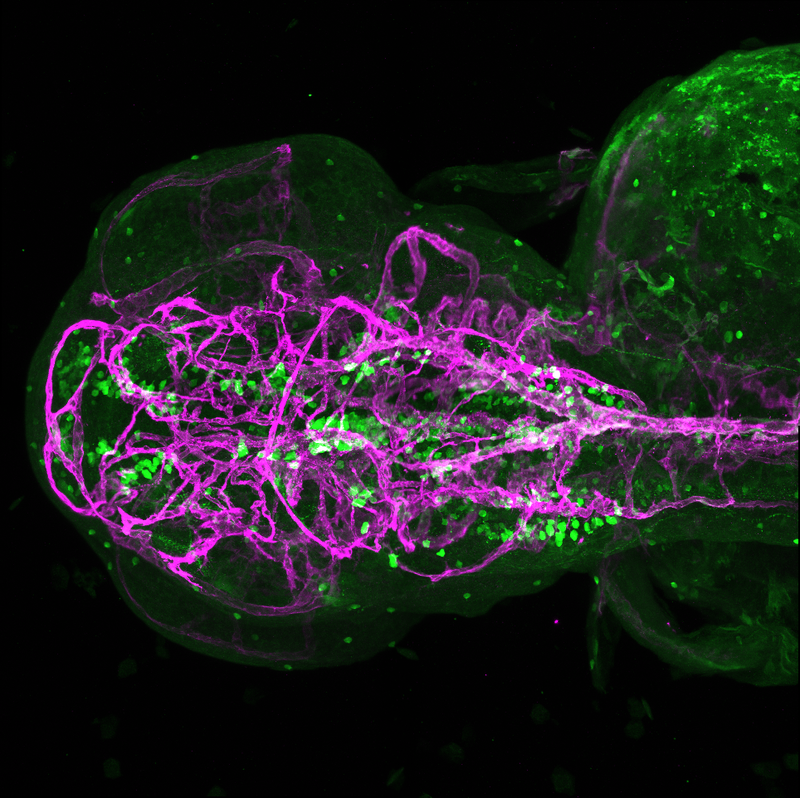 Double staining of the expression patterns of kdr:mCherry (magenta) and Vmat2:GFP (green) in a 5 days old zebrafish larvae. Double-staining (IHC) of the expression patterns of kdr and Vmat2 at 7 days post fertilization. 7 days old zebrafish larvae. Double-staining (IHC) of the expression patterns of kdr and Vmat2 at 10 days post fertilization. 10 days old zebrafish larvae. Double-staining (IHC) of the expression patterns of kdr and Vmat2 at 11 days post fertilization. 11 days old zebrafish larvae. Double-staining (IHC) of the expression patterns of kdr and Vmat2 at 15 days post fertilization. 15 days old zebrafish larvae. Double-staining (IHC) of the expression patterns of kdr and Vmat2 at 3 weeks post fertilization. 3 weeks old zebrafish larvae.